For those of you who missed the pictures in the last post, here’s to making up for it. 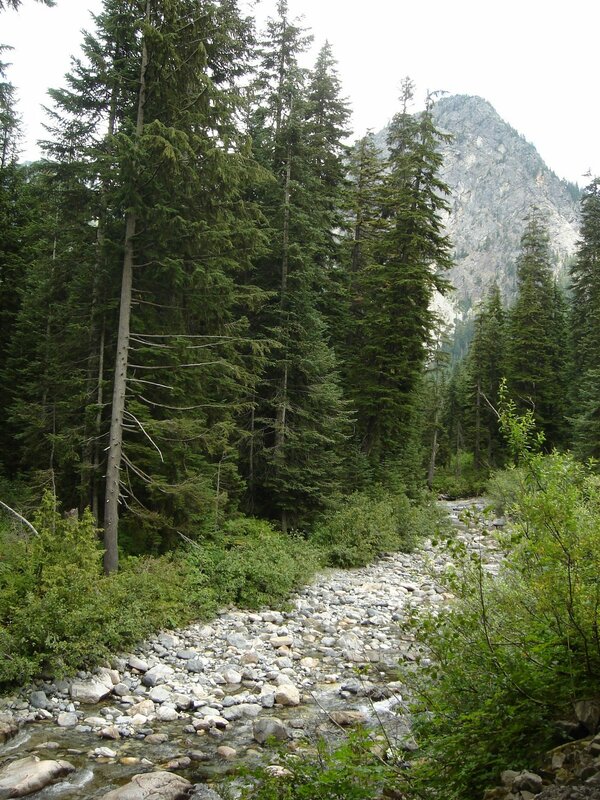 Lots of new ones to share (and even more from both the Cascades and Seattle)! I have to admit straight off the top that I didn’t make it to Mt. Si and I’m a little embarassed that I keep mentioning it and never follow through, but Seattle was calling my name and I had to heed and go explore the city, which is what I did on Sunday afternoon. But before I get to that, a quick recap (with pictures) of last weekend. Check out my last post for more on last week’s adventures. On to this past weekend! Saturday I did something I’ve never done before: went to a PGA golf tournament. Yes, you read that correctly. The girl who’s terrible at golfing went to a professional tournament – and enjoyed it! A fellow at my church had complimentary passes to the Boeing Classic at the Snoqualmie Golf Course and offered me a couple tickets to check it out. So Leslie, the woman I’ve been staying with, and I ventured over in the morning to watch the first nine holes. It was quite chilly and overcast but thankfully the rain held off until after we’d left. Honestly, I’m not sure what to say about it because my understanding of golf is so minimal, but the grounds were beautiful and the homes on the course reminded me of Greenwich homes (big, well-kept grounds, etc.). The golfers were good and watching them putt at the end of each hole was the most exciting part. No pictures, though, because it was against the rules. Oh well. And Sunday was a trip into Seattle. Would you believe that it’s literally 15 mintues drive without traffic? Talk about close! It was my first time in the city just exploring (I’ve had dinner at the Space Needle, but that’s it) and I really enjoyed it. 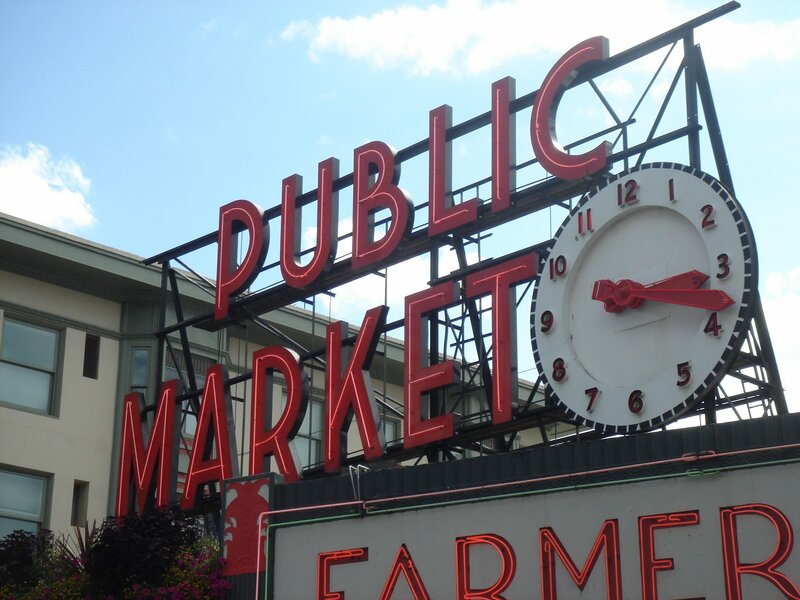 Pike Place Market is a busy maze of vendors, but enjoyable every second. Check out the famous sign (above), the Pike Place Fish Co. where they throw fish, flower vendors that people were going crazy for, and the original Starbucks. I refrained from going into the original because the line was just too long, but one day I’ll head in for a brew from the first! I also checked out Pioneer Square, which is the oldest section of Seattle. A good chunk of it survived the fire in the early 1900’s so it’s a fun mix of old and new buildings. Because I was there on a Sunday afternoon a lot of the stores were closed, but I bet I’d love it even more when everything’s kicking. 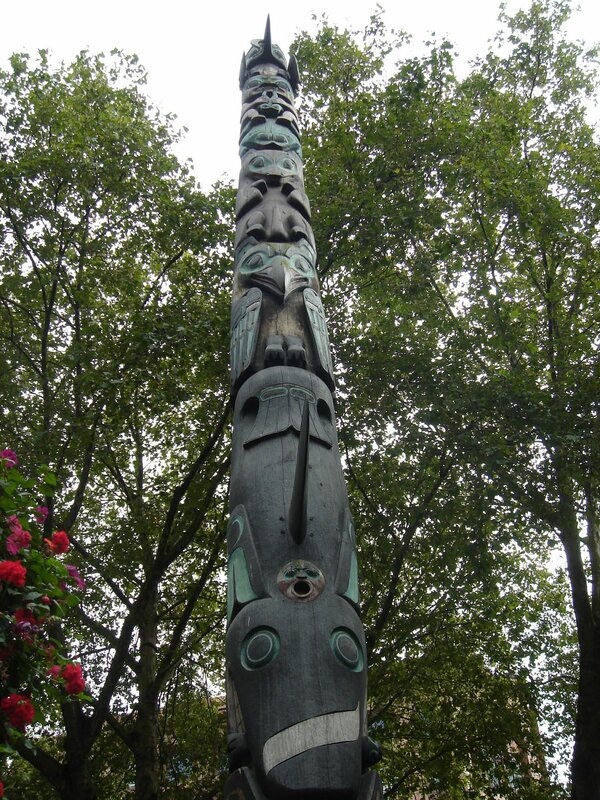 Check out the totem pole, and in the Web album see a cool old structure, and words on a building that any good Midwestern girl would notice. In other news, I have an apartment! Painting and moving in this weekend so I’ll finally have a place of my own to call home. Pictures to come. Hope you’re all well. Keep in touch and leave me comments! Ok, so I don’t have any pictures because I haven’t taken any shots over the last week, it’s because I forgot the cable I need at home. Oy vey! Hopefully you all will forgive me and let me make it up to you next time with lots of photos. The last week, honestly, hasn’t been much different from the rest. I’ve finally settled into a bit of a routine in terms of my schedule. Up at 5:45 a.m., out the door by 6:50, in the office about 7:10, out the door again at 3:30 p.m. and exploring Issaquah. Thankfully there are a few highlights throughout the week to keep me from going stir crazy. This past Saturday and Sunday, Doug Chase (the new business manager) and I were introduced to the congregation during all four services at the Issaquah campus. (We also have a West Seattle campus.) This isn’t anything out of the ordinary except that now when I walk through the church lobby or am out and about places I get random “hellos” and “oh, you’re Pastor Steve’s new assistant”. It’s great, really, because even though I’m still easily the new girl, it doesn’t feel like it as much. Sunday afternoon was fantastic! Nothing really exciting, just three movies back-to-back on TV and talking with friends. Can’t beat a relaxing day at home. Speaking of home, I’m finally going to see this apartment that I keep talking about on Monday. I’m 99% positive that I’ll be moving in there (the rent, utilities included, is a good deal), but this will put my mind at ease. Plus, I’ll be able to start thinking about how to decorate it and what to do with that second bedroom. Yes, two bedrooms! Let’s see, this week is pretty slow. I went to dinner and to get my nails done with a new friend, Marianne, last night. She works here at the church for the youth department so we had plenty to talk about. And tonight I’m having dinner with Rebekah, the wife of the children’s pastor. Looking forward to it! Otherwise, I may head into Seattle on Saturday to explore or take a dance class…or maybe I’ll finally try to hike part of Mt. Si. I know, I keep talking about it but haven’t done it. I hadn’t planned to blog again quite so soon but I had quite an adventure last evening hiking with a new friend and wanted to share. The church runs a number of small interest groups that meet once a week called Life Groups with one of them focusing on hiking. The children’s pastor, Dan, mentioned this one to me because I was going on and on about wanting to hike Mt. Si (still on the docket for the weekend) and how it would be a great way to not only hike but meet new people. 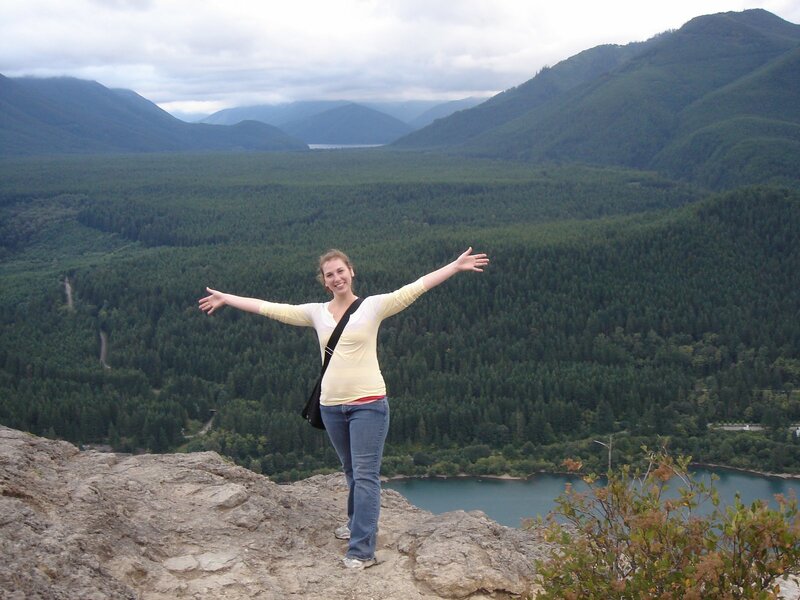 So it turns out that Angela, the leader, had a hike scheduled for Thursday evening up Rattlesnake Ridge, which is at the most 15 minutes from where I’m staying. At about 6 p.m. Angela picked me up and we made our way to Rattlesnake Lake where the trail starts. (It happened that it was just the two of us that hiked, which was great because we got to talk and learn more about each other than if there’d been more people.) 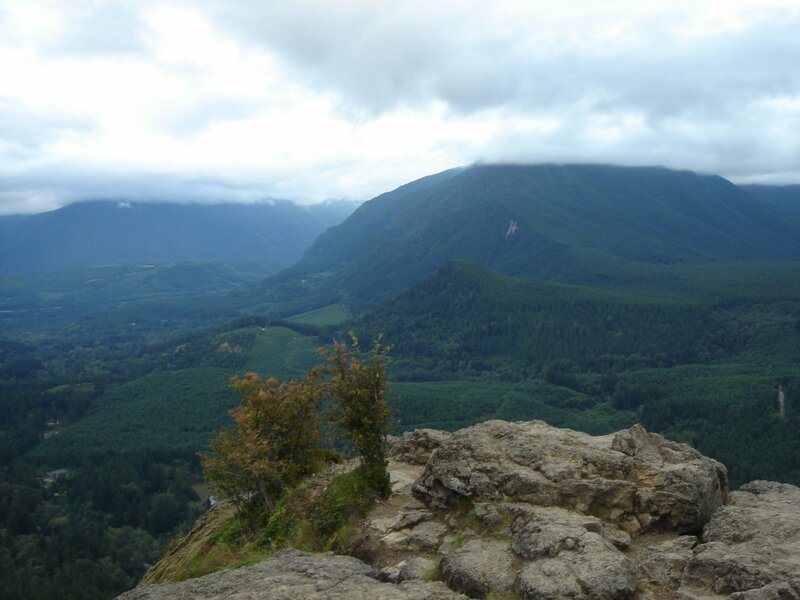 The hike was two miles each way (elevation gain of 1,175 ft.) and took about an hour to get up and slightly less down. It was amazing with spectacular views along the way. 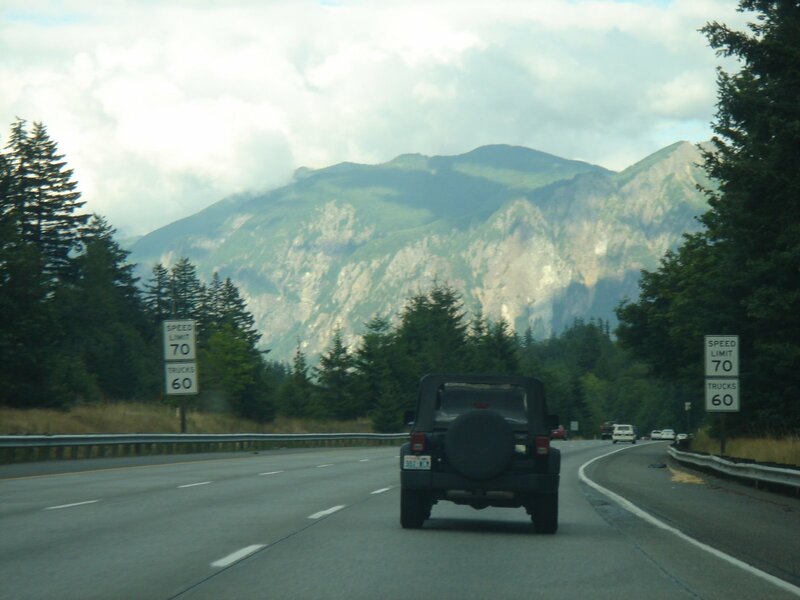 I was amazed at the trees when you first start up the mountain – there were so many and they’re so tall and skinny – and there were massive boulders – larger than the big Hummers – that were just sitting there between the trees. They must have fallen from the mountain at some point but now they’re covered with moss and plants and things are starting to grow out of them. Of course there’s a point that you pass those trees and hit the traditional evergreens, which lend a different kind of feeling to the hike. But the view from the top was something else! 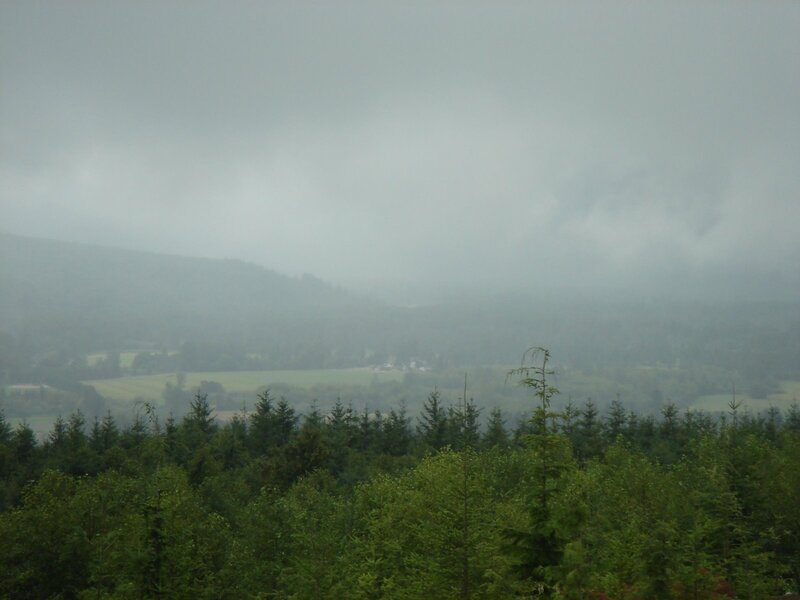 Mountains on all sides with clouds so low that they cut off the tops of them – it was like a natural ceiling. And there were multiple lakes with water so clean and blue it almost looked fake. What a reminder of how beautifully different our country is from coast to coast! Check out the pictures below or for all of them, check out my online gallery with other pictures from my time here so far. All in all, I’m loving the job and the (indirect) way that I’m doing something good through work. The stress, strain, frustration, and sadness of moving so quickly and so far away from friends has been worth it so far. And I think that when I finally get into an apartment (which should be soon!) and all of the regular fall church activities start up in September and I can get into dance classes I’ll be even happier. It’s been another fun week both personally and professionally. I finished my book – Lipstick Jungle by Candace Bushnell – which I’m sure you were dying to hear about. More interestingly, I explored a really old, really big tree in Snoqualmie yesterday evening. So I over estimated the diameter of this tree when I was talking with my Mom this past weekend – it’s not the 100-ft. diameter I guessed – but it’s still large! 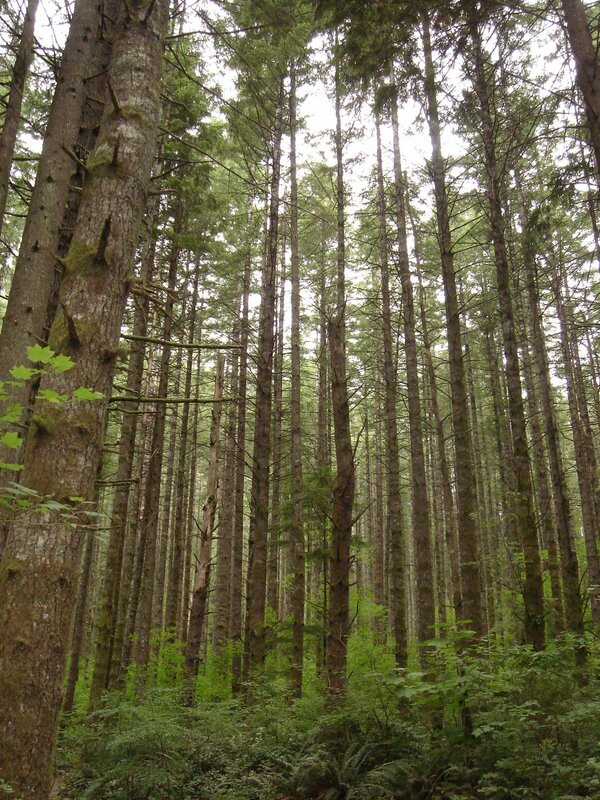 Turns out the Douglas Fir is only 11’6” at its widest and 8’10” at its most narrow and weighs 39 tons (78,000 lbs.). Um, that’s a big tree! And it’s old, too. 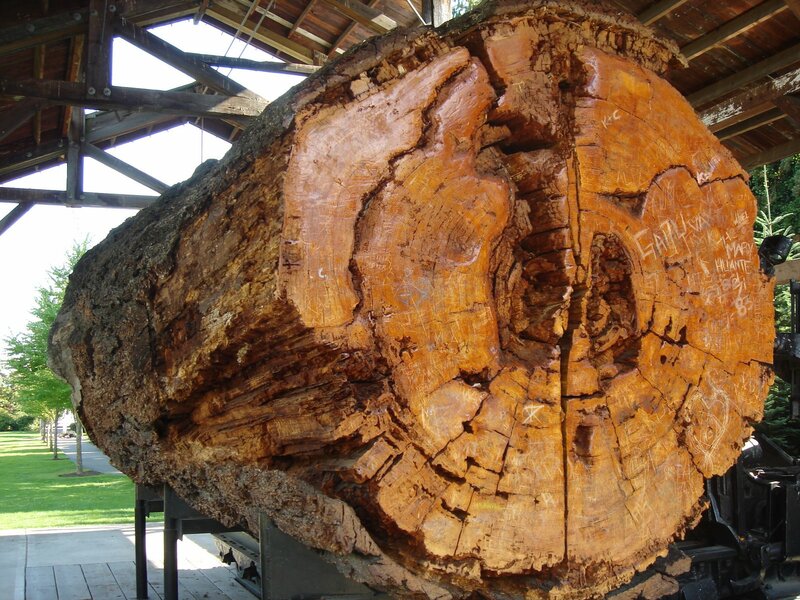 It was a seedling in 1587 and cut down in 1987, which makes it 400 years old. I know, I know, that’s a lot of information about a tree but this thing caught my interest last week and it’s as thought it’s been calling my name to come and learn about it ever since. The tree is part of an exhibit at the Northwest Railway Museum in downtown Snoqualmie and sits on a big train bed under a specially made house alongside the main road in town. As I was driving to Snoqualmie Falls last week (see my previous post about the Falls) I drove through the center of town to get there and stared at a series of old train cars and cabooses sitting outside the museum. And among the cars was this massive part of a tree. 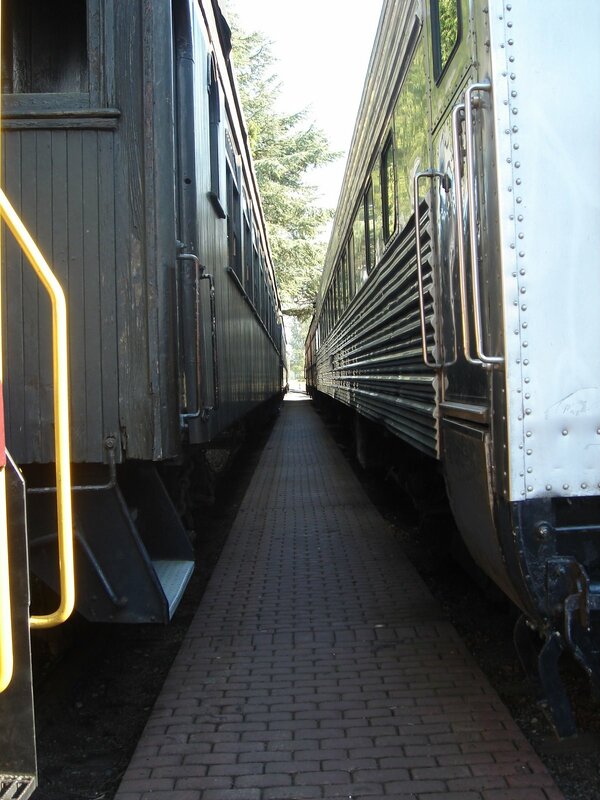 As an aside, the museum offers rides on its old passenger trains each Saturday and Sunday during the summer. Now I’ve been on old train rides before (most recently last summer in the Black Hills of South Dakota) and yes they’re slow, but I saw the Snoqualmie train last weekend and boy is it slow! You certainly don’t miss the scenery as you’re chugging past it! By the way, I got such a kick out of downtown last week. I literally turned left onto Rt. 202 on the East side of town, took note of a sign proclaiming “Welcome to Snoqualmie,” picked up a leisurely pace of about 25 mph, passing the trains, tree trunk, bowling alley, drive-through espresso shop, and a handful of restaurants, to find myself on the other end of town and watching a sign telling me “Thank you for visiting Snoqualmie” a short two minutes later. Reminds me of small town South Dakota. Ahh, the memories! Overall, everything else is going smoothly here. I have a strong lead on an apartment – praise God! – and am getting more and more acclimated to work and all of the new information, people, and tasks. And still continually amazed at my surroundings and its beauty. 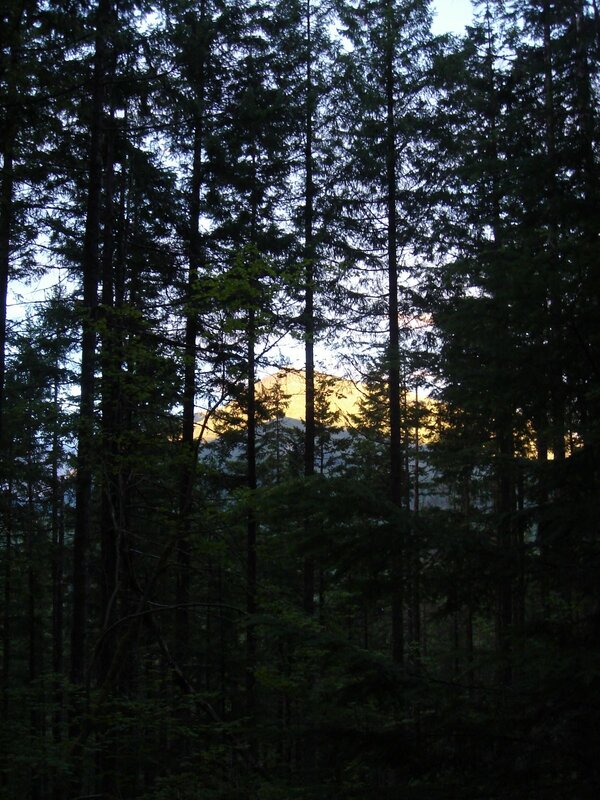 Seriously, it’s so cool to wake up and watch the sun begin its ascent over the mountains, slowly illuminating the evergreens on its way. Nearly every morning there’s fog in the valleys, which is so interesting to see. As a kid I always wanted to touch and walk through the clouds so to see it just hanging in the air so close and peaceful I have the strongest urge to pull the car off the road and go running into the fields to pick up a little of the fluffy white stuff. If only! Weekend plans are to hike at least a little bit of Mt. Si. Will keep you updated! Made it through a week! Well, I made it through my first week! It was a trying one with lots of challenges but just as many rewards. As for work, Wednesay, Thursday and Friday were spent mostly in meetings with the pastoral and office staff getting to know people. It sounds a bit dry, but it was honestly a great and casual way to get to know people, hear their “story” and get a handle on how they work best. Outside of work I tried to do something every day that would help me learn the area. Wednesday I drove around and got lost (the best way to learn an area in my mind). 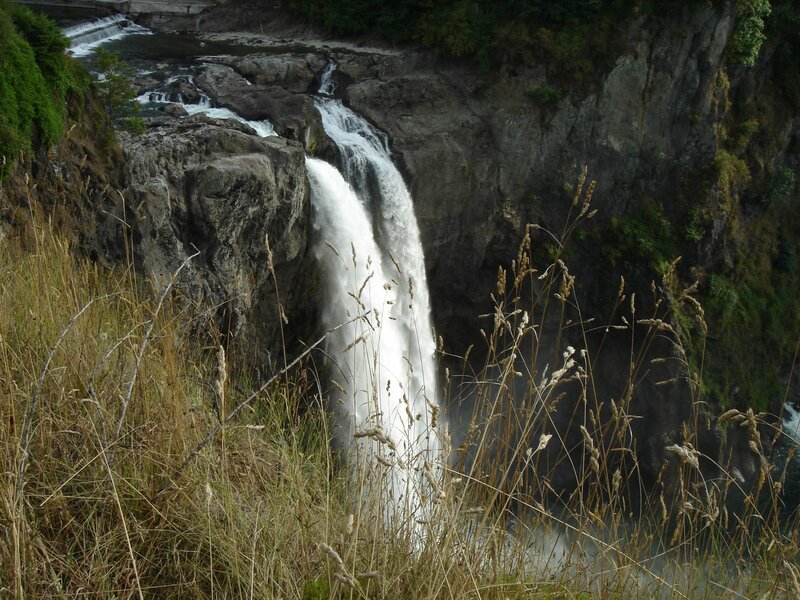 Thursday I visited Snoqualmie Falls just down the road from where I’m staying. It’s a beautiful little spot where you can actually hike down to the water (I’ll do that another time). Friday I toured a few apartment complexes (expensive and shabby for the money). Saturday I went shopping at an outlet mall (new clothes, yay!). And Sunday was all about church and lunch with the senior pastor, his wife, the business manager and his family. I’m still amazed at the landscape whenever I’m out and about. Would you believe that the outlet mall is nestled between two mountains. What a treat to walk out of a store and see this gigantic green mountain towering over you. And the drive to work on I-90 snaking its way around and between the trees and fog. I never imagined I would be living someplace like this. This is a first for me: my own blog (I’ve blogged on behalf of others, but never putting my own ideas and experiences down on the screen). So here it goes! My thought behind this is to keep you all updated on what’s going on with me, especially since I’ve moved West and it seems to be a bit harder to connect over the phone with some of you! I’ll share stories, pictures, and one day (if it’s possible on blogger) videos. So check back often for new pictures from the Seattle area, stories of my adventures (you know there will be plenty), and thoughts on what’s happening in my life. It should be interesting and at the least it will keep you up-to-date on life out here. To start, I’m on my fourth day at the new job and loving it. The people are wonderful and the work – so far – is fulfilling. I have about a 20 minute drive to the office each way from the house where I’m living temporarily. Thankfully a 20 minute commute here is nothing like a 20 minute commute in Fairfield County. My spedometer actually stays at about 70 (the legal speed limit) and the green scenery rushes by! Other than work I’m keeping occupied by exploring the area after I leave the office (my hours are 7 a.m.-3:30 p.m.). Some would call what I’m doing “getting lost and getting frustrated” but I prefer the more adventurous term “exploring.” 🙂 One of these adventures lead me to a little park on the top of a hill near the house. Check out the view of the valley through the clouds. How neat! I’m apartment shopping tonight and tomorrow…wish me luck! And drop me a line when you get a chance!